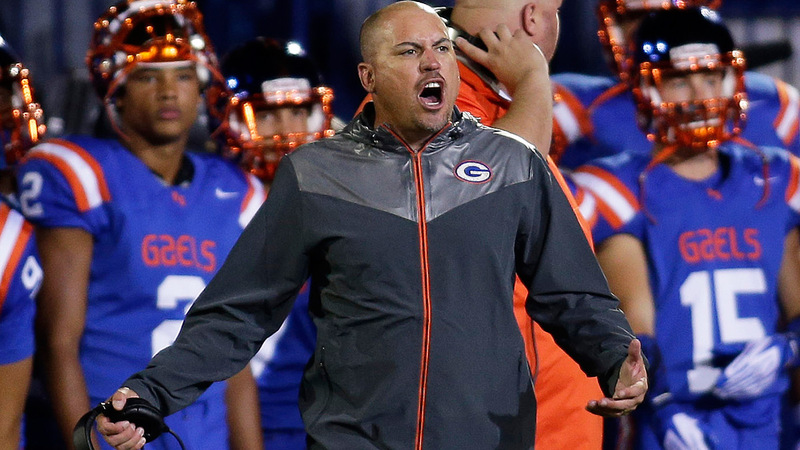 Tony Sanchez couldn’t lose as Bishop Gorman High School’s football coach. UNLV hasn’t been able to win for decades. So with Sanchez becoming just the fourth coach in the last 40 years to make the jump directly from high school head man to D-I boss, is the coach or the team taking the bigger risk? For the record: Yes, Tony Sanchez knows what he’s getting himself into. He wasn’t born yesterday, and he didn’t ride into town yesterday, either. Sanchez is a Vegas guy, the longtime captain of a local high school juggernaut, and he doesn’t need anyone to remind him that his new job, as head football coach at the University of Nevada, Las Vegas, is his profession’s equivalent of the Bermuda Triangle. He’s seen it up close, known the men who have disappeared into the void. He understands the odds. Broach the subject of UNLV’s miserable reputation and the first-time college coach will finish your sentence for you. He might as well have appealed to the law of averages, since he’s stepped into a situation where there’s nowhere to go but up. Because at UNLV, his predecessors found to a man that there was nowhere to go but the scrap heap: The last seven coaches have averaged five years and 19 wins before getting a pink slip, and the last six — Wayne Nunnely (1986-89), Jim Strong (1990-93), Jeff Horton (1994-98), John Robinson (1999-2004), Mike Sanford (2005-09), and Bobby Hauck (2010-14) — combined to produce five winning seasons in nearly three decades. Altogether, UNLV has endured 230 losses since 1986, more than any FBS school in that span except New Mexico State (250), Temple (237), and Kent State (232). No UNLV head coach has ever lasted more than six years in Vegas, or gone on to hold the same job at another Division I school. This is not a coach issue … This is a system, infrastructure, commitment issue that I am concerned about. “There’s been more of a football commitment made at [Nevada-Reno] from a facility standpoint than there has at UNLV. Our locker room is the worst locker room in college football. “If people really want to win here, if they’re going to hold the football coach and the football coaching staff here to a high standard, they need to put their money where their mouth is. I don’t believe that’s ever been done here. I don’t believe it was done one bit during the time I was here. That was the verdict from the guy who, upon his arrival, had announced his goal “to win the Mountain West Conference championship, go to a bowl game and to be ranked in the top 20 in the nation every year.” In five years, Sanford’s teams won just 16 games and failed to produce a winning season. That logic has created a slightly surreal dynamic in which it’s unclear which side in this professional marriage is taking the bigger chance on the other. From the outside, based on any conventional assumption about how and where successful college coaches are made, it’s easy to leap to the conclusion that the university is betting the farm on an experiment that may very well blow up in its face and set the program back another five years. From the inside, though, it’s not hard to see how Sanchez’s arrival could be greeted as a kind of coup: For the first time in years, fans and boosters alike have a chance to engage with the program through a guy they already recognize as a winner. 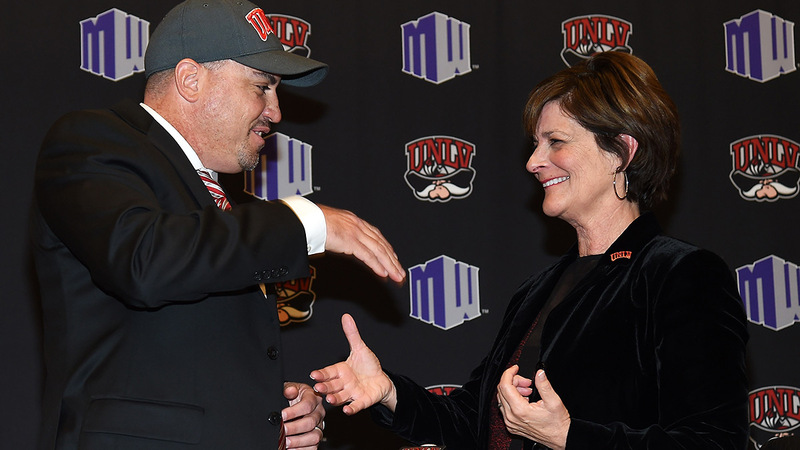 And if Sanchez’s success translates to the college level, UNLV’s nearly unprecedented decision to hire a coach straight from the high school ranks stands to pay off, quite literally, in a very big way. No one on either side of the divide can argue with Sanchez’s status as the city’s reigning gridiron icon: While UNLV languished at the bottom of the Mountain West standings, Sanchez’s Bishop Gorman teams won 85 of 90 games and claimed six straight state championships in his six years as head coach. (The program was on the upswing before Sanchez arrived, having taken the state championship two years earlier, but the 2007 title was Gorman’s first since 1983.) The 2014 outfit ended its season ranked as the no. 1 high school team in the nation according to MaxPreps’s composite rankings, having navigated an ambitious out-of-state schedule in September and subsequently outscored in-state opponents by nearly 500 points (543-54) in its last nine games. During Sanchez’s (relatively brief) tenure, Gorman players went on to play at Oklahoma, USC, Stanford, California, Oregon, Miami, Washington, Duke, Notre Dame, UCLA, and Arizona,1 among others. By the end of Sanchez’s stint, Gorman was welcoming dozens of college coaches in the span of a single month. Arizona’s starting quarterback, Anu Solomon, was Gorman’s starting quarterback on four state championship teams from 2009 to 2012. Even more crucial for a UNLV athletic department perennially in the red, though, are Sanchez’s connections to resources. As a parochial school, Bishop Gorman isn’t limited to fielding players from within the confined borders of a district, and under Sanchez the program became a magnet for both high-wattage talent and high-rolling boosters. Last year, the roster included both Snoop Dogg’s son and Muhammad Ali’s grandson, who played in a stadium named after a billionaire casino magnate, Lorenzo Fertitta, better known as the UFC’s chairman and CEO. Fertitta and Dana White are Gorman alums, and Fertitta led the fund-raising for a new, $93 million campus in 2007. All three of Fertitta’s sons played at Gorman, including Nicco Fertitta, a three-star safety who’s bound for Notre Dame later this year. Snoop, meanwhile, paid tribute to the team last fall in a rap that also featured Flavor Flav, and Snoop’s son, four-star receiver Cordell Broadus, chose UCLA in a high-profile, televised signing day announcement. Broadus’s recruitment was chronicled in a five-part ESPN documentary, which cast an even brighter spotlight than usual on the already nationally relevant Gaels. With backing from Lorenzo Fertitta and his brother, Frank, Sanchez oversaw the construction of a 41,000-square-foot training facility at Gorman that makes the average high school locker room look like a garage. The school has so thoroughly dominated the rest of the state of Nevada in football, basketball, and baseball over the past decade that the state’s governing body for high school sports has contemplated banning the Gaels from postseason competition to give other, less well-heeled schools a chance. Gorman and UNLV are only 20 minutes apart, but the athletic cultures might as well exist on different planets. In fact, as soon as Sanchez emerged as a candidate for the opening at UNLV, speculation centered on the financial windfall that might follow if his Gorman benefactors could be convinced to invest in Sanchez’s new program as lavishly as they had in his old one. Even before the hire was official, Lorenzo Fertitta publicly denied that he’d made any commitment to the university in the event that Sanchez happened to be hired, but he hasn’t ruled anything out since the move officially occurred. Whether or not Sanchez gets some Gorman money to follow him to UNLV, he’ll be battling history as he tries to get his high school success to immediately translate to the FBS. Though it’s hardly impermeable, the membrane that separates high school and college coaching is thicker than the one between the college and pro ranks. Numerous college coaches started out on the Friday Night Lights circuit, and a few of the most high-profile names in the college game today built substantial résumés there before moving on to Saturdays. Auburn’s Gus Malzahn spent 14 well-documented years as a prep kingpin in Arkansas, where he won three state championships behind the hurry-up, no-huddle philosophy that has continued to confound opposing defenses in the SEC; Baylor’s Art Briles spent two decades in the Texas high school ranks, where he won four state titles in the 1990s; Arizona State’s Todd Graham and SMU’s Chad Morris also came out of extended tours in Texas high schools; Boston College’s Steve Addazio won three consecutive state championships at Cheshire High in Connecticut; Ole Miss’s Hugh Freeze won two state championships in a decadelong prep tenure in Memphis, Tennessee, which later provided the backdrop for the literary/cinematic gold mine that was The Blind Side. To some extent, the game remains the same at every level, and good coaches are adaptable to new environments. • Bob Commings, Iowa (1974-78): Commings inherited a team that had failed to win a single game in 1973 — still the only winless season in Iowa history — and he didn’t move the needle much, turning in a 17-38 record over the next five years. His last team finished 2-9 and was held to single digits in seven of its nine losses. • Gerry Faust, Notre Dame (1981-85): Faust’s record in South Bend (30-26-1 over five seasons) looks a little better on paper than his critics might recall, until you consider the context: In the 15 years before Faust, Notre Dame had won more than 80 percent of its games under coaches Ara Parseghian and Dan Devine, with a dozen top-10 finishes in the AP poll and three national championships; in the first 11 years after Faust, Notre Dame went on to win more than three-fourths of its games under Lou Holtz, with five top-10 finishes and a national title in 1988. By contrast, the Faust-era Irish more than earned their reputation as the black sheep, finishing unranked all five years. • Todd Dodge, North Texas (2007-10): Like Sanchez, Dodge came to a struggling, obscure program from a nearby prep powerhouse; Dodge limped away four years later as one of the biggest flops of the decade. 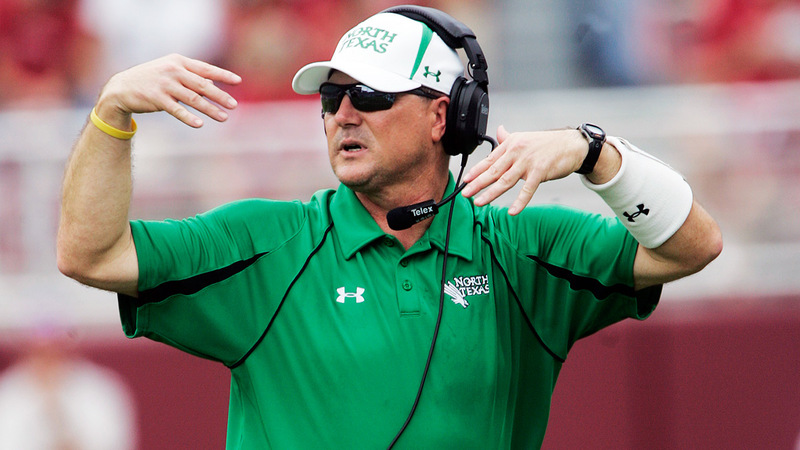 North Texas managed six wins in 43 games before sending Dodge packing midway through his fourth season. He’s currently back in the high school ranks in Austin. That’s it. In Sanchez’s lifetime, that’s the club. To find a bona fide high school–to–college success story at the major-college level, we’d have to go back 70 years, to Paul Brown’s arrival at Ohio State from nearby Massillon High in 1941: Brown delivered a national championship to OSU in 1942 before setting off for his Hall of Fame pro career with the Cleveland Browns and Cincinnati Bengals, both of which he founded. This is one instance where the “best since World War II” distinction isn’t saying very much. Still, in Sanchez’s eyes the structural advantages that made his Bishop Gorman teams virtually unbeatable within state lines also make him uniquely prepared to take the reins of a substantially larger operation. The logistics of running a program at Gorman are on a different scale than at a run-of-the-mill neighborhood high school: The budget is larger, the donors have deeper pockets, the road trips are longer and more complicated. How many high school coaches have experience chartering planes to play in nationally televised games several states away? How many have already had a hand in building a facility like the one at Gorman, which easily eclipses the university’s existing complex in terms of size, cost, and amenities? The first priority for UNLV is improving its decrepit facilities, the same ones Sanford derided upon his ouster as the worst in the country. On the other hand, Bishop Gorman did not position Sanchez as the underdog, which he most certainly will be across town. The last time UNLV was relevant in football — the only time UNLV was relevant in football — was 1984, when the Rebels finished 11-2 and won the Pacific Coast Athletic Association title behind the talents of quarterback Randall Cunningham. A year later, all 11 wins and the conference championship were forfeited as punishment for playing ineligible players, resulting in a premature exit for coach Harvey Hyde following a 5-5-1 campaign in 1985. Hyde’s successors have succumbed to the abyss in short order. In 2014, attendance fell — officially, the average crowd at Sam Boyd Stadium this season was 15,674, second-smallest in the Mountain West — and the books continued to bleed red ink as the record sank to 2-11; more than 56 percent of the total athletic budget is subsidized by the university, according to USA Today, and even after accounting for the university’s share the department is plagued by a deficit of more than $2 million. A composite of scores from multiple recruiting sites ranked UNLV’s 2014 recruiting class as the second-worst in the conference. In response to those challenges, Sanchez points to the untapped recruiting potential of Las Vegas’s geography — “We’re three and a half, four hours from Los Angeles, five hours from Phoenix, six hours from Salt Lake City … we have to engage those areas and make UNLV an option” — and to a veteran coaching staff, which came together quickly with experienced assistants, from Nebraska, Oregon State, and USC, who have recruited all over the country. Sanchez coached eight players at Bishop Gorman who earned four-star recruiting ratings from Rivals.com in a period in which UNLV didn’t sign a single four-star prospect and only had one player drafted by the NFL. The results have already begun to show: After less than two months under Sanchez’s watch, UNLV managed to assemble the Mountain West’s seventh-best recruiting class on signing day.